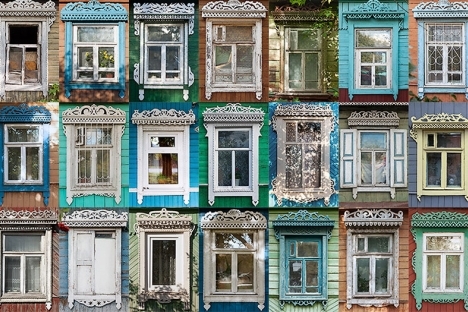 Ivan Khafizov’s project nalichniki.com is a collection of thousands of photographs of traditional hand-carved wooden window frames from all different parts of Russia. The functional purpose of a traditional Russian window cover is to fill the gap between the actual window frame and the wall of a wooden house. In the 18th century, window covers were an integral part of wooden architecture, and craftsmen employed a unique woodcarving technique, which has been preserved in regional traditions to this day. The intricacy, complexity and beauty of the window cover craft continues to turn heads in 2012. Ivan Khafizov has been photographing window covers all over Russia for some years now, and he recently founded the nalichniki.comproject – an online museum where his inspiring photo collection is available for all to enjoy. RBTH: What is it that attracts you to window covers? What is special about them, and are they unique to Russia? Ivan Khafizov: The window-cover craft is one of many elements that make up the fabric of Russian culture. It came about somewhere a very long time ago and has spread across a huge area, drawing on the traditions of all the many ethnic groups who have carried on the craft. So window covers are something of great cultural importance; almost every city in Russia has some fine examples, but, for some unknown reason, most people tend not to notice them. So, for example, many people know about Gorodets painting, Gzelian crafts, khokhloma – these are all crafts that involve painting on wood, and each is named after the city in which the technique originated. The same goes for window covers – the styles vary and each place seems to have its own, unique approach to carving and decorating them. Every city must have had its own individual rules and traditions when it came to making windows. I like window covers because they are beautiful. And, in this case, the beauty and intricacy of the object has nothing whatsoever to do with its functional purpose! Nevertheless, even the poorest peasants made a point of carving and decorating the window covers on their houses. And this is partly what gave their village its identity; it meant each village had its own individual style. So the window covers formed the face – the brand, if you like – of every populated place in Russia. As to exactly where these window covers are located and why, there is no straight-forward answer. My theory is that window covers are traditional everywhere that was under the influence of the Russian Empire at the end of the 19th Century, when window covers were at the height of their popularity. But that’s just one of many possible answers. RBTH: How did you project start? Were you just taking pictures for fun, or was it more of a research project? I.K. : None of this was planned, the whole thing just happened. I think it was inevitable that, sooner or later, I would start taking pictures of window covers: I had time to spare, as well as a passion for history, architecture and photography. By a twist of fate I ended up in the city of Engels, and then I was in Rostov and Borisoglebsk. It was impossible not to notice that, in the first city, the window covers were colorful and with shutters; in the second, they were high, exact and shutter-less; and, in the third city, the windows were similar to the ones in Rostov, but with much more intricate decoration. This caught my attention, and I started photographing window covers in various cities every time I traveled. Once I had taken pictures of windows in about 20 cities, I started to read books on the subject and, all of a sudden, I was hooked. So I started all this more as a collector than an amateur photographer. RBTH: What were people’s first reactions to your photographs when you first started? I.K. : You may laugh, but at first there was no reaction at all! I had already made photo-collages of windows from five cities, before someone on the internet noticed what I was doing and took an interest. Up until that point, I must have taken and developed about a thousand photos of different windows, and, at the time, I was absolutely determined to continue with my new-found passion, no matter what. The project only really attracted public attention once it had been going for three years. RBTH: What can you learn about a city by its window covers? Are there many people in Russia who are able to “read” them? I.K. : There are various misguided theories that window covers contain some sort of message, and, for some reason, these messages are thought to be bound up with the Slavic tradition. This is completely wrong. Window covers are traditional over a huge area – right from the Sea of Japan, all the way across to Poland. I was recently told that these sorts of windows can even be found in Alaska. It is highly unlikely that these window covers all “speak” the same symbolic language, because they were carved by people from different worlds – people who spoke different languages, worshipped different gods. The people who made them came from very different cultural backgrounds, so, unfortunately there is no one able to “read” window covers who could tell us exactly what they all mean. That being said, there is a small group of people who understand the symbolic meaning of the patterns seen in some types of woodcarving. Of course, this is mainly for the few types of window covers that actually do share common Slavic roots, and these are typical of several regions in Russia - they are most often seen in the Yaroslavskaya, Vladimirskaya, Ivanovskaya and Nizhegorodskaya regions. In Krasnoyarsk, I found what looked like the upside-down Cyrillic letter “Ш” on hundreds of window covers. A man turned up on one of the forums and linked this symbol to a tribal emblem from Kazakhstan – a “tamga”. And this symbol – a wooden pitchfork – is the emblem of the ancient Geraev dynasty, which was around at the end of the 14th century. And so the window cover revealed who had occupied this territory 700 years ago. RBTH: Do you have a favorite region for window covers, or, perhaps, a favorite master window-maker? I.K. : The window covers in the far-off city of Tomsk are definitely among my favorites. This is probably because they are completely different from the ones you can find around here. Although I am also very fond of the wide variety of window covers you can find in Yegoryevsk. RBTH: You want to use crowdfunding to finance your project. How effective can this method be in Russia? I.K. : If it works in America, Europe and Australia, then why shouldn’t it work here in Russia? Of course it will work. Russia is undoubtedly slightly behind in this area; the first crowd-funded projects in Russia took off in 2010. Crowdfunding is still quite new here and not many people are familiar with it as a concept. For example, nearly everyone who helped get this project off the ground learned about crowdfunding for the first time. As a result, their support was all the more meaningful: these people weren’t afraid to try something new! But many are still wary, and time is ticking away.